In addition to 60 billion current and historic web pages, we have unique access to more than 30 million publications and books. Our plagiarism software uses a sophisticated algorithm to detect not only exact matches but also paraphrased text. In contrast to other plagiarism checkers, we don’t store or sell your work. You can delete your document anytime. It’s hassle-free! The Scribbr Plagiarism Checker has been named the best plagiarism checker of 2019. It detects more plagiarism than any other plagiarism check and is highly accurate. Compared to other plagiarism checkers, the report contains fewer false positives, which saves students time. Your plagiarism report contains three main elements: a similarity percentage, a list with matched sources and a preview that highlights matched text in your document. Whereas many other plagiarism checkers can only detect exact matches, the Scribbr Plagiarism Checker also detects patchwork plagiarism. In other words, our software can detect plagiarism even when you paraphrase sentences or combine multiple sources. The similarity percentage indicates what portion of your text matches other sources in our database. The plagiarism software excludes your reference list and other sections where similarities are common but are not actually plagiarism. Therefore, the similarity percentage is highly accurate. All sources containing text that is similar to yours are listed and sorted according to significance. This list helps you easily identify the original source and cite it accordingly. You will even receive a preview of the original passage, so you can easily compare it to your own text. When you find plagiarism in your document, it is important to cite the source correctly. Our Plagiarism Knowledge Base helps you understand and correct plagiarism. Still not clear? Start a live chat with our support team! Upload your paper, dissertation or essay in less than 2 minutes. Our plagiarism software will compare your document to billions of sources. 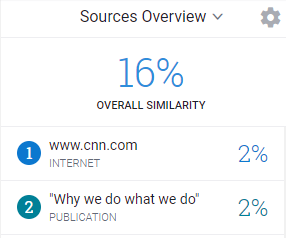 The report shows you a plagiarism percentage and a list of matched sources. Rewrite your text as needed, and give credit to the original author. Our guide will help you! The Scribbr Plagiarism Checker helps students detect and correct plagiarism. In addition, we will help you truly understand plagiarism, so you can avoid it in the future. Our articles on citing sources, types of plagiarism, paraphrasing, quoting and more provide easy-to-understand explanations. All the articles are available in our free Knowledge Base! Thousands of students have used the Scribbr Plagiarism Checker to check for unintentional plagiarism. We developed the Scribbr Plagiarism Checker in partnership with Turnitin. Our team is happy to help you before, during and after the plagiarism check. Easy to use, access to scholarly databases and a helpful Knowledge Base. Your document is compared to over 30 million publications and books. Our plagiarism checker works for .doc, .docx and .pdf files. Almost all major languages are supported, including English, Spanish, French and more! How long does the Scribbr Plagiarism Check take? The Scribbr Plagiarism Checker needs approximately 10 minutes to process your document. This time is needed to compare your paper with a massive database with billions of web pages and publications. Documents larger than 35.000 words can take a bit longer. We will send you an e-mail when the check is finished! more than 30 million scientific publications. In the Sources Overview section of the plagiarism report, you can view the database in which the original source was found. The Scribbr Plagiarism Checker is optimized for students, which means that you will receive a detailed report with extra information to fix and avoid plagiarism, similar to the report received by your school. Universities often have their own database of (prior) theses. Scribbr has no access to those databases. When you copy data from another thesis that is not publicly accessible, the Scribbr Plagiarism Checker will neither be able to detect plagiarism nor identify the source of this data. However, most papers are actually publicly accessible since many universities and schools have public databases. This means that the Scribbr Plagiarism Checker is able to find these papers.